The Animal Justice Center works to seek justice on these main target areas. Legislators on Monday howled for perhaps the most bipartisan legislation of the entire session when Gov. John Hickenlooper signed two bills aimed at the state’s furriest friends. The governor — accompanied by his own dog, Skye, at the state-of-the-art Denver Animal Shelter — signed Senate Bill 226, which aims to curb a rash of dog shootings by law enforcement, and Senate Bill 201, designating shelter pets as the official state pet. Rep. Brittany Pettersen, D-Lakewood, who sponsored SB 201, joked about how the measure surprised her by becoming more controversial than expected. “It ended up being one of my most contentious bills,” she said to laughs from an audience assembled outside the shelter, flanked by drooling, excited, attention-seeking dogs. The measure passed the Senate by a vote of 23-11 and the House by a vote of 3921, with votes crossing party lines. It started innocently with a project by students from Peakview School in Walsenburg. The idea was to teach the kids what the legislative process looks like. When they proposed making dogs and cats adopted from shelter and rescue centers the official state pet, they received an upfront — and at times grueling — look at the inside baseball politics of the legislature. Lobbyists representing dog clubs and shows, pet store owners and groomers became concerned that the bill could be viewed as insulting to their trades. The fear was that Coloradans would default to shelter pets, when the American Kennel Club reported purebred dog ownership in Colorado to be an estimated $20.5 million per year industry. Others felt the bill was unfair to a variety of shelter pets, including reptiles and birds. Throughout the process, sponsors came across opposition. Committee hearings were packed with leashed dogs accompanying their owners who came to testify. Throughout the halls of the Gold Dome, barks could be heard, while reporters, staffers, lobbyists and legislators navigated a maze of wagging tails. Students testified on behalf of rescue dogs and cats, calling the measure a matter of “life and death” for their furry friends. The two sponsors of SB 226, Sens. David Balmer, R-Centennial and Lucia Guzman, Denver, meet at the Denver Animal Shelter, where Gov. John Hickenlooper will sign the bill as well as SB 201. In the end, however, lawmakers kept the bill general to all shelter dogs and cats. “I want to congratulate Gov. Hickenlooper… for helping these legislators and others have a tremendously successful session on behalf of so many interesting Coloradans. But today we’re celebrating their work on behalf of our fur-covered friends,” remarked Linkhart. The governor rescued Skye in Fort Collins before she was trained in the state prison dog-training program. Skye has become a bit of a fixture around the executive offices of the Capitol. Perhaps the meatiest of the bills, however, was SB 226, which requires police officers to allow owners an opportunity to first save their dog when an officer is responding to a nonviolent call. It also creates a volunteer task force, including animal welfare experts, to create a three-hour training webinar for law enforcement. The measure comes as state officials have reported more than 40 incidents in which law enforcement has shot family dogs. Brittany Moore, a 30-year-old Erie resident, became the face of the movement after a traumatic incident in May 2011 in which an Erie police officer, Jamie Chester, shot and killed Moore’s 4year-old German Shepherd, Ava. The bullet severed Ava’s spinal cord, ultimately killing her. The rawhide bone she had in her mouth at the time of the shooting fell to the ground as Ava let out an awful squeal. “It doesn’t just go away,” Moore said of her harrowing experience. “We’ll always miss her, and she’ll always be in our hearts. The measure was actually supported by law enforcement across the state. It also received unanimous approval from both chambers of the legislature. “This is a bipartisan day for dogs,” declared Sen. David Balmer, R-Centennial, who sponsored the measure with Democratic Sen. Lucia Guzman and Rep. Lois Court, both of Denver. Rep. Don Coram, R-Montrose, also sponsored the bill. “This was as much about protecting the sheriffs and the police as it was about protecting the dogs,” explained Court. Jennifer Edwards, an attorney with the Wheat Ridge-based Animal Law Center who helped draft the language of the bill, said her firm is representing the owners of 16 dogs involved in shootings in Colorado. The owner of a dog shot and killed by police in 2012 will receive a $262,000 settlement from Commerce City in Colorado, according to a city spokeswoman. 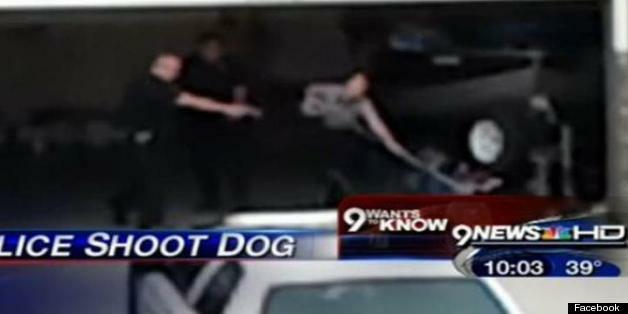 On Nov. 24 2012, three Commerce City Police officers responded to reports of a "loose, vicious dog." Police said Chloe, a 3-year-old dog, aggressively ran toward the officers. During the encounter, Officer Robert Price, shot and killed the dog. The dog was first shocked with a stun gun and then shot multiple times. A neighbor took cellphone video of Chloe's death, which was a key piece of evidence in the case. (1) Short title. This section shall be known and may be cited as the “Dog Protection Act”. (II) Allow a dog owner or animal control officer, whenever the owner or an animal control officer is present and it is feasible, the opportunity to control or remove a dog from the immediate area in order to permit a local law enforcement officer to discharge his or her duties. (c) Recognize the important work of the dog protection task force in developing the training and incorporating the specifics of the training into the statutes. The seventeen members appointed to the task force represented a victim of a dog shooting, veterinarians, animal welfare advocates, animal behaviorists, animal control officers, the sheriffs, the police, and legal professionals. The training includes instruction regarding a dog's body language and how to interpret it, scene assessment, tools to use in dog encounters, situations involving multiple dogs, how to interact with a dog, and responses to dog behavior. The dog encounters training required by this section was designed to protect law enforcement officers, animal control officers, dog owners, innocent bystanders, and the dog. The training is not intended to provide dangerous dog training. Most importantly, the training was designed to limit, as much as feasible, the instances in which an officer would need to use deadly force against a dog, since the possibility of collateral damage, injury, or death from stray rounds is ever-present when a law enforcement officer uses deadly force. (a) “Dog” means any canine animal owned for domestic, companionship, service, therapeutic, assistance, sporting, working, ranching, or shepherding purposes. (b) “Dog owner” means a person owning, possessing, harboring, keeping, having guardianship of, having financial or property interest in, or having control or custody of, a dog. (c) “Licensed veterinarian” means a person who is licensed pursuant to article 64 of title 12, C.R.S., to practice veterinary medicine in this state. (d) “Local law enforcement agency” means a municipal police department or a county sheriff's office. (e) “Local law enforcement officer” means any officer in a local law enforcement agency. The term does not include an animal control officer, code enforcement officer, or a deputy sheriff who is assigned exclusively to work in jails, court security, or administration. (4) Training required. (a)(I) Each local law enforcement agency is required to provide to its officers training pertaining to encounters with dogs in the course of duty. At a minimum, the training must cover the policies and procedures adopted by the agency pursuant to subsection (6) of this section and assist officers in assessing what dog posture, barking and other vocalizations, and facial expressions typically signify, the options for distracting and escaping from a dog, options for safely capturing a dog, and defensive options in dealing with a dog. (C) Require all local law enforcement officers hired on or after June 30, 2015, to complete the training required by this subsection (4) within each officer's first year of employment. (b)(I) In establishing the training program required by this subsection (4), a local law enforcement agency shall adopt or incorporate any minimum training curricula developed by the dog protection task force created in subsection (5) of this section. (II)(A) The training program required by this subsection (4) must be wholly or principally provided or overseen by either a qualified animal behavior expert or licensed veterinarian. The qualified animal behavior expert or licensed veterinarian selected to provide the training must possess the minimum qualifications specified by the dog protection task force created in subsection (5) of this section. (B) Nothing in sub-subparagraph (A) of this subparagraph (II) requires live, in-person training be provided to local law enforcement agencies by qualified animal behavior experts or licensed veterinarians. (III) In order to reduce the costs of providing the training program required by this subsection (4), a local law enforcement agency may develop its own web- or video-based training or utilize such training developed by the dog protection task force under subparagraph (III) of paragraph (d) of subsection (5) of this section, and local law enforcement agencies are encouraged to seek qualified animal behavior experts or licensed veterinarians who will volunteer to provide or participate in the training. (IV) A local law enforcement agency may collaborate with county sheriffs of Colorado, incorporated, the Colorado association of chiefs of police, the Colorado fraternal order of police, and the Colorado veterinary medical association, as well as nonprofit organizations engaged in animal welfare, to develop the training program required by this subsection (4). (c)(I) The training program required by this subsection (4) must consist of a minimum of three hours of training for local law enforcement officers. (II) Nothing in this section prevents a local law enforcement agency from implementing a training program or adopting policies and procedures that exceed the minimum number of hours or other requirements set forth in this section and by the dog protection task force pursuant to subsection (5) of this section. (5) Task force. (a) There is hereby created the dog protection task force. (I) One member, appointed by the Colorado veterinary medical association, with expertise in canine behavior or other animal behavior. Licensed veterinarians and attorneys are ineligible for appointment under this sub-subparagraph (I). (II) The entities responsible for appointing task force members shall notify the Colorado veterinary medical association in writing of the identity of their appointees prior to the first meeting of the task force and upon any change in their appointees. (III) Members of the task force shall not be compensated for, or reimbursed for expenses incurred in, attending meetings of the task force. (B) One of the members appointed pursuant to either sub-subparagraph (E) or (F) of subparagraph (I) of this paragraph (b), as mutually agreed to by the appointing authorities. (c)(I) The task force shall hold its first meeting no later than September 1, 2013. (II)(A) The task force shall meet as often as necessary to complete the tasks described under paragraph (d) of this subsection (5) on or before July 1, 2014. (B) After July 1, 2014, and prior to January 31, 2015,the task force shall meet as often as it deems necessary, but no less frequently than once, to ensure that the curriculum, guidelines, and web- or video-based training are implemented and effective. (III) The task force shall hold its meetings and staff those meetings in a location offered for those purposes by one of the entities represented with task force membership, with preference accorded for the principal office of the Colorado veterinary medical association. (III) Develop, using volunteered and donated resources to the greatest extent possible, web- or video-based training that may be utilized by a local law enforcement agency to fulfill the training requirement of subsection (4) of this section. (e) The task force shall not recommend that the training required under this section be conducted by the peace officers standards and training board created in part 3 of article 31 of title 24, C.R.S. (f) The curricula, qualifications, and web- or video-based instruction described in paragraph (d) of this subsection (5) must be readily accessible by Colorado's local law enforcement agencies on one or more internet web sites designated by the task force. (g) The task force created by paragraph (a) of this subsection (5) is dissolved, effective January 31, 2015. (6) Policies and procedures. (a)(I) In addition to the training program developed under subsection (4) of this section, not later than September 1, 2014, each local law enforcement agency in the state shall adopt written policies and procedures that are specifically designed to address encounters with dogs occurring in the course of duty and the use of force against such dogs. (C) The reasonable opportunity for a dog owner to control or remove his or her dog from the immediate area. The policies and procedures adopted in accordance with this sub-subparagraph (C) must allow a local law enforcement officer to take into account the officer's own safety and the safety of other persons in the area, the availability of nonlethal equipment, the feasibility of so allowing a dog owner to act considering the totality of the circumstances, including the presence of an animal control officer or whether the call is a location that is listed in the dangerous dog registry created in section 35-42-115, C.R.S., or is a location at which illegal narcotics are suspected to be manufactured or trafficked, or any exigencies that may be present, such as when the local law enforcement officer is responding to a call that asserts or suggests that a person has been bitten by a dog or is in physical danger. (b) Each local law enforcement agency shall make the written policies and procedures available to the public for inspection in accordance with the “Colorado Open Records Act”, part 2 of article 72 of title 24, C.R.S. (7) Immunity. All task force members, as volunteers, are immune from civil actions and liabilities pursuant to section 13-21-115.5, C.R.S. (8) Scope and effect. (a) This section applies only to local law enforcement agencies and is not intended to affect, implicate, or abrogate the authority of the peace officers standards and training board created in part 3 of article 31 of title 24, C.R.S. (b) This section is not intended to apply to situations in which a dog is shot accidentally, including when a local law enforcement officer intends to fire at a person but inadvertently shoots a dog. (c) Nothing in this section affects or abrogates the ability of any duly authorized person to impound or euthanize a dog in accordance with section 18-9-202.5, C.R.S., or in accordance with any resolution adopted pursuant to section 30-15-101, C.R.S. Added by Laws 2013, Ch. 208, § 2, eff. May 13, 2013. Amended by Laws 2015, Ch. 68, § 2, eff. April 3, 2015. Denver City Council's decision not to provide a service-dog exemption to its longtime pit bull ban isn't just bad public policy, in the opinion of Jennifer Reba Edwards, attorney and founder of the Animal Law Center. It's also illegal -- which is why her firm is suing the city, as well as Aurora, on behalf of three disabled plaintiffs who use pit bulls as service dogs. As we noted in our March post "Pit bull ban: Disabled Vietnam, Gulf War vets sue Denver and Aurora for discriminating against their service dogs," the Animal Law Center complaint alleges that banning pit bulls for use as service dogs violates the Americans with Disabilities Act. Although reports suggest that Aurora may be willing to create a service-dog exception for pit bulls, Edwards isn't sure at this point whether that's the case or not. But she sees no ambiguity in this week's 9-4 vote in Denver City Council to forbid use of pit bulls as service dogs. And in her view, "it's completely contrary to what they can do." Councilman Charlie Brown disagrees, arguing that Denver has a right to take this action as a home-rule city. But in Edwards's view, "that's inapplicable here. This is a federal matter. It would be akin to Denver saying women don't have a right to vote on certain issues, and they don't care about what the federal government has to say about that, because they're asserting home rule. And they can't do that. Home rule is more applicable when you're looking at a matter of statewide or local concern, but this is an ADA discrimination case -- and they're choosing to discriminate against disabled people." Edwards notes that the ADA doesn't restrict service dogs on the basis of breed -- a position reemphasized by the agency in July. "The clarification strengthened our position and our case," she believes. Could some locals pretend their pit bull is a service dog to get around the overall ban in Denver -- a danger raised by some council members? "That's very convenient for them to say," Edwards maintains, "but it's a felony to say your dog is a service dog when it's not. So this isn't a slippery slope. I think the slippery slope would be people lying about their dog being a service dog, because eventually, they're going to get caught. So I find that to be nothing more than an excuse." Moreover, Edwards points out that the Denver policy doesn't only impact residents. "What if there's a grandfather who lives outside Denver and his grandson would like to go to a baseball game?" she asks. "If he has a pit bull that's a service dog, can he not take his grandson to the game and a restaurant afterward? Can he not contribute to getting Denver out of its budget deficit? And that brings up another point. Why would Denver want to fight something like this so zealously and waste taxpayer money they don't have? "Something else that's very disappointing is the fact that Denver's historically led the way with ADA issues. It's one of the most accessible cities in the country, and because of that, many ADA conventions and seminars on the national level are held here -- and that happens because Denver is put on a pedestal in regard to the way they handle ADA issues. So how is this going to look? I think it gives a black eye to the City of Denver in regard to their treatment of disabled persons. It really sets them back a lot." Right now, the Animal Law Center suit "is stayed," Edwards says, "and we're waiting for some litigation issues to be resolved. But as soon as the case resumes, we intend to prosecute it to the fullest extent of the law. Our goal is to seek a permanent measure to ensure that people have the right to the service dog of their choosing and not be discriminated against, so they can feel safe in Colorado, safe in Denver, and safe traveling through Denver." These laws continue to be challenged, both locally and nationwide. Family says their autistic child, dressed as Elsa, was turned away by mall Santa because of her service dog Pup-cake. The Animal Law Center in Wheatridge, Colorado are disappointed with the recent decisions taken by the city councils of Denver and Aurora with regard to their breed bans. In both cities last night, the councils voted to retain breed bans without making reasonable accommodations for citizens who utilize restricted breeds as service dogs. "While any action taken by either city council would have no affect on our class action lawsuit, it is unfortunate that both councils have decided to take the positions that they have," said Jennifer Edwards, lawyer and founder of The Animal Law Center. "The ADA has never restricted the breed of service dog, but Denver and Aurora have. 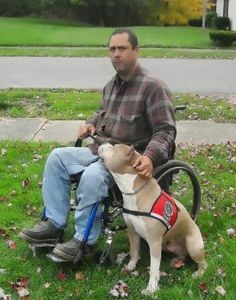 That violates federal law and the rights of citizens with disabilities who have utilized pit bulls as service animals. The Animal Law Center is representing three plaintiffs in a class action lawsuit against Denver and Auruora on the basis that the breed ban violates portions of the Americans with Disabilities Aft. That Federal law allows for people with disabilities to use any breed of animal as a trained service dog. The suit was filed on March 31st, 2010. Glenn Belcher credits his pit bull, Sky, with cutting down on the nightmares that come from his tour of duty in Iraq during Desert Storm. The dog steadies him as he goes up stairs. And Sky's soothing presence has allowed Belcher to reduce the number of antipsychotic drugs he used to take to one, down from four. So Belcher was shocked when he moved from California to Denver in 2009 to learn that the dog a nurse prescribed to help him overcome his disabilities was not welcome. Sky violated the city's ban on pit bulls, and Denver officials told Belcher he would have to move outside the city limits if he wanted to keep the dog. Now the city of Denver appears to be relenting, following new advice from the U.S. Justice Department about how the Americans with Disabilities Act should be interpreted. The new federal regulation states that the act allows "any dog" that is trained to do work or perform tasks for the benefit of an individual with a disability, including a physical, sensory, psychiatric, intellectual or other mental disability, to be classified as a service animal. "As far as the ADA, it's now pretty black and white, according to what the U.S. Department of Justice has prepared," said Nancy Severson, Denver's manager of environmental health services, the agency in charge of enforcing the pit-bull ban. "If it's a service dog, and they claim it's a service dog, and the dog is providing the support for a disability, we will have to honor that," she said. A proposed ordinance that will get initial consideration Monday would allow pit bulls certified as service animals in Denver. Belcher, one of three owners of pit bulls certified as service animals who are suing Denver and Aurora, says it's about time. He warned city officials last year they were discriminating against him and his dog and making it impossible for him to access public spaces. The dog has remained in Denver since Belcher got a temporary restraining order against the city while the lawsuit was pending. "This breed has been hijacked by gangbangers and thugs and people who don't know how to raise animals to begin with," Belcher said. "There are no bad dogs, only bad owners." The new law would amend a pit-bull ban Denver enacted in 1989 after the Rev. Wilbur Billingsley was attacked by a pit bull that bit him 70 times and left him with two broken legs. The ban, which was upheld in Denver District Court in 2004, is deplored by many animal-rights activists, but applauded by those who say pit bulls can be violent. Since 2005, the city has seized 3,186 pit bulls; 2,123 were euthanized. The new exemption could pose hurdles for officials trying to crack down on problem pit bulls. If a person claims their pit bull is certified as a service animal, city officials won't even be allowed to ask to see the certification. "This does blow a big hole in the breed ban," said Councilwoman Carla Madison, long a critic of the city's pit-bull ban. The Animal Law Center's persistence to fight the battle to let service pit bulls stay finally paid off! Justice for Veterans! Justice for service dogs! Justice for all! Many are uniting to gather signatures for a petition to remove the pit bull ban from Aurora, Colorado through change.org. Kennel refuses to reimburse family for emergency medical bills for Maltese puppy after providing guarantee that dog was healthy. Attorneys with The Animal Law Center in Wheatridge, Colorado announce they have filed a civil lawsuit today against North Washington Street Kennel (NWSK), 7174 N. Washington St., Denver, CO, on behalf of clients Rochelle and Dano Goforth of Commerce City, Colorado. The Goforths are suing the kennel and owner Jeff Fortin for fraud after they unknowingly purchased a Maltese puppy infected with Parvo, Coccidia (intestinal parasites), Giardia, and kennel cough. On May 26, 2009, Dano Goforth bought a white Maltese puppy (Lacie) from the North Washington Street Kennel and received a “10-day health guarantee,” but just three days after purchase, Lacie began showing signs of serious illness. For the next several days following strict kennel instructions, the Goforths shuttled Lacie between the kennel and its approved veterinarian for treatment. However after Lacie went into hypoglycemic shock on June 3, the Goforth’s chose to take Lacie to a different veterinarian, who immediately began providing emergency care. Despite its guarantee that Lacie was healthy at the time of purchase, the kennel refused to reimburse the Goforths for the emergency medical bills, which totaled over $2,000. Instead owner Jeff Fortin offered the Goforths a replacement puppy, which they refused. Most recently Fortin was forced to euthanize 1,200 puppies after a breeding operation owned by him in Kansas was linked to a distemper outbreak at a pet store in Cheyenne, Wyoming. We support Harley! The little dog with a big dream. 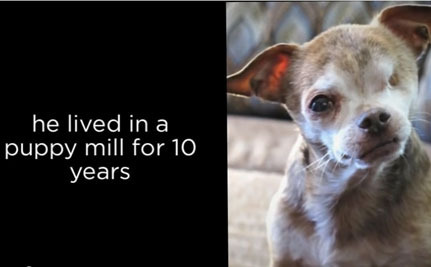 Harley was one of the lucky ones to be rescued from a puppy mill. His family has campaigned to use social media and charitable events to rescue puppies and close down puppy mills. 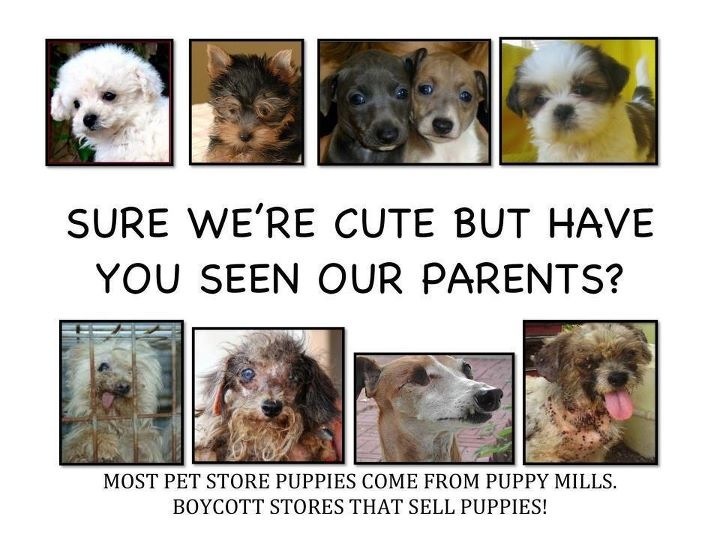 The family is seeking justice for these dogs by prosecuting PACFA violations and close down the 121 puppy mills in Colorado. Harley wants the voice of all those suffering in puppy mills to be heard! Educating the public as well as veterinarians against dangerous drugs. The story began back in May of 2009, when Sophie, a golden retriever, injured her knee. Cooper did his "due diligence," researching the best animal surgeons in the business before bringing her in for treatment. He chose a Longmont veterinary clinic, and when the surgeons prescribed Rimadyl, an anti-inflammatory drug, for her recovery, he didn't give it a second thought. Cooper says he did exactly as the surgeons instructed, giving Sophie one pill in the morning and one pill in the evening. But after four or five days, she quit eating, which he calls "unprecedented behavior. By the time Cooper got Sophie back into the hospital, she was so sick that she spent the next twelve days in an intensive care unit. "During that time, the vets realized, through multiple tests and weeding-out procedures, that it was Rimadyl toxicity that had caused her to go into liver failure," he recalls. "The Pfizer vets had never seen a dog that sick that wasn't dead, so they just said, 'Keep fighting'. ""So we called the vets, and they said to give the dog Pepcid; they didn't say stop giving her the drug or anything." He goes on. "So we gave her the full seven day course of the drugs, which makes me sick to my stomach, in hindsight, because I feel like I was poisoning my dog because she would only eat the pills from me"
After those twelve days, Cooper brought Sophie home and continued to administer treatments, which he described as having to "hang bags and stick her with needles." When her condition failed to improve, he brought Sophie to the Colorado State University Veterinary Teaching Hospital, where further tests confirmed that her liver was failing due to Rimadyl toxicity. She had a feeding tube inserted, and Cooper was allowed to bring her home again. He describes that time as a "horrible roller coaster," especially when her feeding tube became clogged. Six weeks later, Sophie died at the CSU hospital. "Very quickly, her body just gave up," Cooper said. "I was racing up there, and I got north of Longmont, and they said she was having agonal breaths" -- the term for abnormal breathing patterns is derived from "agony" -- "and they put her down. So I couldn't even be there when they put her down, and I still feel guilty to this day." Jennifer Edwards, attorney with Wheat Ridge's Animal Law Center, took Cooper's case knowing she would be going up against Pfizer, whose legal resources dwarf those of the admittedly tiny law center.Throughout the course of Sophie's treatment, surgeons and veterinarians never informed Cooper about the potential side effects of Rimadyl on older dogs. He admits that had he looked the drug up on the Internet prior to giving it to her, he probably would have looked for alternatives. Still, the medical professionals in charge of prescribing the drug never provided information. If they had added just that one sentence about side effects, he says, the whole thing could have turned out differently. "We are small, but mighty," she maintains. "Going against a corporation the magnitude and size of Pfizer is certainly a challenge. But we didn't give up. And as a result of that, we reached a settlement. We overcame a lot of hurdles. They tried to dismiss the case -- they tried a number of legal strategies -- but we were able to legally maneuver around them to the point to where they were willing to settle with us." The terms of the settlement are undisclosed. But for Cooper, it was never about the money. He plans to take "every penny" paid out by Pfizer to lead an informative campaign against Rimadyl and Pfizer's continued use of the controversial drug. Both Cooper and Edwards say they have received hundreds of e-mails and Facebook messages from other people facing similar problems with the drug. Although he's happy about reaching a settlement, Cooper admits the victory rang a little hollow due to the time he spent "watching my dog suffer for six weeks -- just a horrible death -- and feeling guilty because I'm the one that gave her the drugs. I feel like I poisoned her ,because I did all the due diligence and still ended up with the worst outcome possible. So I feel a lot of guilt. I killed my baby." Disclaimer: This site is owned and maintained by the Animal Justice Center, a non-profit corporation. The content on this site is offered only as a public service to the web community and does not constitute solicitation or provision of legal advice. This site should not be used as a substitute for obtaining legal advice from an attorney licensed or authorized to practice in your jurisdiction. Nothing on this site is intended to create an attorney-client relationship and nothing posted constitutes legal advice. Interacting with e-mail, forms, or online forums on this web site does not constitute the creation of an attorney/client relationship between you and the Animal Justice Center. No information communicated to Animal Justice Center through this site will be protected by either the attorney-client privilege or the work product doctrine.